As part of our series of blogs on the various sources of income that investors can include in their portfolio we now turn our attention to Equity Income Funds. These have become increasingly popular among income seekers as returns of 3-4% plus look attractive as yields on fixed interest and cash products continue to hit record lows. However, equity based investments are generally considered to be more risky than fixed interest as they tend to exhibit greater volatility* over the economic cycle. This is because gilts and bonds have fixed coupons and redemption dates giving a more predictable income whereas dividends from shares can be either increased substantially or cut to zero. Bond issuers can default on payments but this is most likely to occur in the high yield sector. The price of equities will also fluctuate to reflect the current outlook for the business and broader economy. Some investors may even prefer to invest in shares directly but of course this involves extra research and monitoring and it should be remembered that holding a small number of stocks can result in a lack of diversification. This could prove costly in an environment where even some leading Blue Chips stocks have cut their dividends of late. Companies announcing lower dividends last year included well known names such as Tesco, Sainsbury and Rolls Royce. Unit trusts and OEICs have to pay out all income they receive from their shareholdings. Investment trusts have an advantage in this respect as they can set aside income when dividends are plentiful and draw on it in difficult times. 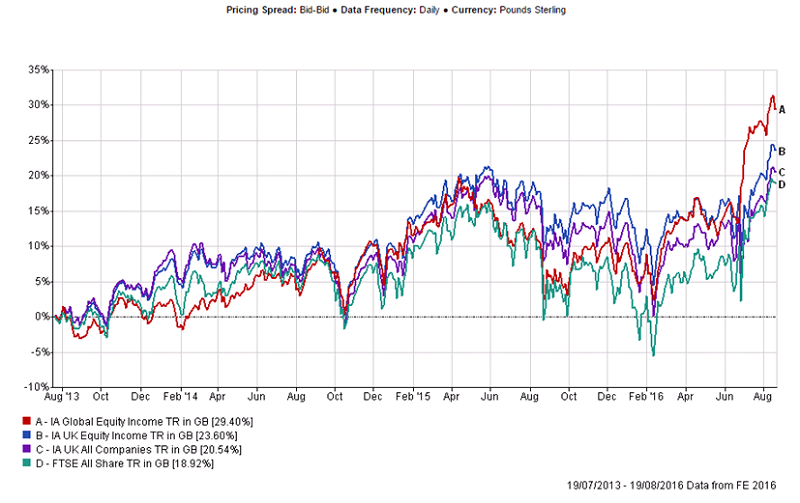 Are the yields on UK equities sustainable? The historic yield on the FTSE 100 on 29th July 2016 was 3.7%** which compared with 4% at the start of the year as the index recorded gains in excess of 10%. However, it has become difficult for companies in industries which have experienced a cyclical downturn to sustain their dividends and consequently dividend cover*** has deteriorated to well below historic levels and stands at a 20 year low. A number have warned they may need to reduce payouts over the course of this year. The sectors most vulnerable to cuts are concentrated in the FTSE 100 whilst the FTSE 250 and FTSE Small Cap yield a more realistic 2.7% and 2.9%, albeit with higher exposure to the uncertainties of the domestic economy. On the positive front the Capita Dividend Monitor study revealed that in Q2 2016 UK dividends hit record levels of £28.8bn as special dividends (one-off payments) quadrupled. However, stripping these out the underlying figure showed a 2.7% fall. Special dividends reflect one off events such as the sale of a subsidiary or a period of buoyant trading which is not likely to continue at the same rate. On the downside it may indicate that a company can find no suitable investment opportunities in their markets. Capita had previously forecast that UK dividends would fall in 2016, for the first time since 2010, but the devaluation of sterling following the EU referendum will provide an additional boost to UK based investors as a large proportion of corporate earnings are generated overseas and furthermore 40% of UK dividends are declared in dollars or euros. Consequently, Capita now expect headline dividends to increase by 3.8% this year to £82.5bn. This mixed outlook means that careful selection of investments is crucial. High yields can be a reflection of mature low growth businesses so in the long term a company that grows its dividend consistently can provide better long term returns than a company that offers a high initial dividend yield which grows more slowly. Also, those companies which reinvest some earnings into the business are more likely to produce capital growth. We reviewed some leading UK Income funds in a recent blog. What makes a successful income fund manager? We can see from the chart below that the UK equity income sector has outperformed both the IA All Companies sector and the FT All Share index over the last 3 years though there was considerable divergence between the best and worst performing funds (with returns ranging from 13% to 33% over the period). Successful income investing demands a disciplined approach and the ability to avoid value traps which is when high yields look tempting but are not sustainable so the dividend is cut and the yield drops often followed by the price. For example, Barclays shares fell more than 8 per cent after announcing a cut in excess of 50% over the next two years. Many companies employ progressive dividend policies which aim to increase payments steadily each year. Cutting the pay-out is a last resort because dividends indicate the underlying health of a company and confidence in its future prospects. In 2015, oil and mining sectors, a large component of the UK market, proved particularly vulnerable as not only did they face a slump in cash flows due to falls in commodity prices but they have high fixed cost bases and require significant ongoing capital investment. Active managers move in and out of sectors depending on economic fundamentals at the time and those who avoided commodities last year would have enhanced their performance considerably. For the astute investor cyclical sectors can present opportunities to buy in at low prices ahead of a recovery and return to the dividend list but timing the move is complex as markets tend to discount future trends well in advance. Regular contact with investee companies is vital. A fund with an income mandate is expected to deliver a premium to the yield on its benchmark index. To qualify for the IA (Investment Association) UK Equity Income sector Funds must invest at least 80% in UK equities and intend to achieve a historic yield on the distributable income in excess of 110% of the FTSE All Share yield at the fund's year end. Some funds focus on the large cap universe while others (which may have ‘multi-cap’ or ‘unconstrained’ in their name) have the flexibility to invest in companies of all sizes. A few, such as Unicorn UK Equity Income, have a predominantly small cap bias. Managers who seek opportunities more widely report that they are still finding attractive yields at reasonable valuations. For the IA Global Equity Income sector Funds must be diversified by geographic region and intend to achieve a historic yield on the distributable income in excess of 110% of the MSCI World Index yield at the fund’s year end. Other geographical regions (Europe, Japan, Asia) do not currently have a separate IA income sector but funds aiming to deliver superior yields will usually have ‘income’ in their title and details of their mandate can be found in their factsheets. An example is Jupiter Japan Income. Some Multi Asset funds (which have varying levels of exposure to equities) also have a focus on yield and we will review these in a future blog. Some income funds offer an additional level of income (look for ‘enhanced income’ or ‘maximiser’ in the title) by using option strategies which surrender some of the potential capital upside of holdings in return for a fee which is used to boost dividends paid out. These can yield in excess of 6% and include Fidelity Enhanced Income and Schroder Asian Income Maximiser. Do I really need to venture beyond the UK? Some investors are happy to stick with the popular UK Equity Income funds with decent track records and well regarded fund managers. A number of these have delivered excellent returns and also provide exposure to global economies (via exports or operations based abroad) without taking on the added currency risk of a fund investing directly in overseas stock markets. However, if UK dividends were to come under pressure, as a result of deteriorating cover, it may be worth looking further afield. If currency risk is a concern take a look at our blog on the availability of hedge classes. While the Brexit vote and subsequent weakness of the Pound has undoubtedly provided an unexpected boost to earnings and dividend payments of overseas earners it has cast a shadow over more domestically based companies until the timing of our departure and subsequent trade arrangements are known. In fact the underlying dividend picture for the UK was the weakest performance of the Group of Seven leading industrialised nations, according to the Henderson Global Dividend Index. The main beneficiaries are the big multi-nationals such as BP, GlaxoSmithKline and Unilever so funds with a Large Cap bias have done well of late in contrast to prior to the referendum when mid and small cap had led the way for some time. However, the concentration of dividend payments from a few large sectors is a concern to some – the top 15 companies account for around two thirds of total dividend payments - so a global income fund may offer useful diversification. The Henderson Global Investors Dividend Index monitors global dividends using 2009 as the base year. Their research revealed that in 2015 global dividends fell by 2.2% to $1.15 trillion although this was depressed by the strength of the dollar and the underlying picture (in local currencies) showed a more healthy 9.9% increase. A headline increase of 1.1% to $1.16 trillion is forecast this year by HGI (+1.4% underlying) but they expect a fall in the UK as companies in areas such as mining and banking aim to strengthen their balance sheets. North America, the engine of global dividend growth, recorded new highs while Europe also delivered promising underlying growth. Corporates are cash rich and stand to benefit from a recovery in oil prices. Europe has many high quality companies paying sustainable dividend streams and in our ISA magazine we featured BlackRock Continental European Income. This fund invests in two segments – around 60% is held in stocks that yield more than the market with the remainder held in names that are currently lower yielding, but where the managers believe there is potential for capital growth. There is mounting evidence that Japanese companies are responding to Government and investor pressure to pay out more of their cash piles. This can be partly attributed to the ‘Abenomics’**** structural reform programme which aims to improve corporate governance and put greater emphasis on shareholder returns. Robust dividend growth in 2015 continued in Q1 2016 with underlying growth of 10.5% according to the HGDI survey. They also pay out a much lower proportion of earnings than in the UK so there is scope for further progress. So there is a growing universe of companies with appealing yields across a number of interesting countries. In July 2016, the FTSE World Index (12 month forward)** has an estimated yield of 2.7%. This reflects the lower 2.2% yield from the US, its largest constituent, compared with 3.8% from Europe ex UK, 4.1% from the UK, 2.4% from Japan and 3.6% from Asia ex Japan. As always, choosing funds with the highest yields could mean taking on more risk. This may reflect the region, for example Emerging Markets, or high pay-out ratios threatening the sustainability of dividends as in the UK. If a single region is beyond your risk appetite a global income fund may be a more acceptable alternative. In our ISA guide we feature Artemis Global Income. Studies have shown that a growing dividend income can account for the majority of the long term returns from equities. Nevertheless, it can be all too easy to get carried away with the search for high income and forget that in the long run it is total return that counts whether that is derived from dividend pay-outs or capital growth. A more growth-orientated fund may offer a low starting yield but if the underlying earnings are growing quickly then escalating dividends should follow. Dividends are not the only way of taking your income; as the fund price rises it is quite easy to sell units down and realise some ‘income’ from your capital gains. The economic recovery in the US is now well entrenched and the Federal Reserve has responded with an interest rate rise. However, with challenges still facing the global economy, rates are likely to rise gradually and to peak at a lower level than in the past. Elsewhere, many countries have yet to return to a healthy growth path, including the Eurozone and Japan, so rates are not expected to rise for some time to come. Hence the search for attractive and sustainable income is likely to remain a priority for many investors. There are also signs that inflation may be picking up from current low levels, particularly in the UK where the weaker pound could lead to higher import prices. Persistent low yields from fixed interest and cash and the inability to protect from inflation (with the exception of index linked products) suggests equities could offer a superior level of income if dividends hold up. Picking the winners (including companies best placed to pay special dividends) and avoiding the losers will be critical so the skills of a good active fund manager could prove invaluable. Although UK dividends have held up reasonably well the level of cover in some sectors is a concern and it may be difficult to grow them at the rate of previous years. It is therefore important to try and identify managers with long track records of delivering progressive and sustainable dividends. For investors looking to diversify their portfolios and maintain a good level of dividend income there are a number of funds with good track records to choose from. Try using our filtering tools to narrow down your selection. As outlined above some regions are delivering greater dividend growth than the UK, albeit from a lower base, which could prove beneficial in the long term. Finally, try not to draw down more income than you actually need because the compounding effect of dividends reinvested on total returns can be very significant over time. *Volatility – The rate and extent at which the price of a security or market index moves up and down. If the price fluctuates significantly it has high volatility. If it moves more slowly and to a lesser extent, it has lower volatility. This is a common measure of risk.